Click here for our 2018 Zero Waste Stats! 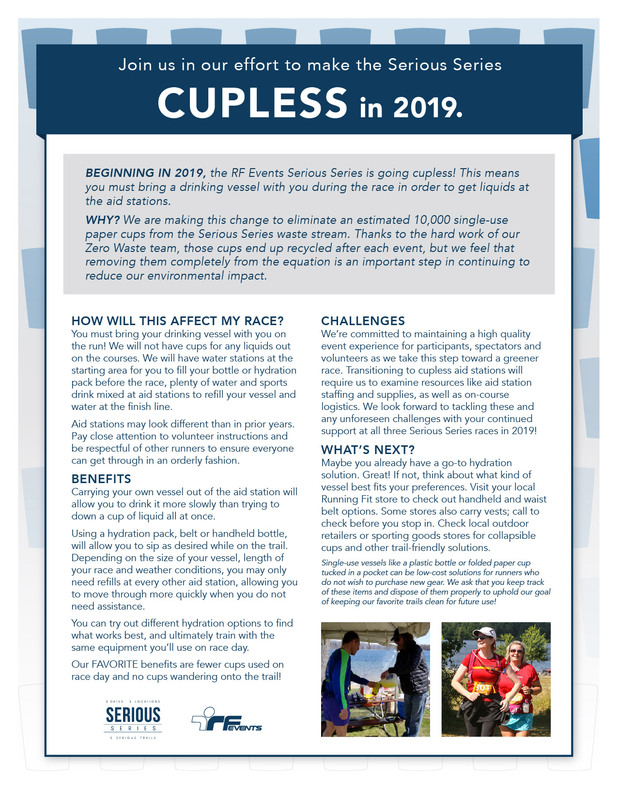 Read more about the Serious Series going CUPLESS! On the winter run, it's not unusual for the temp to start off at 20 degrees, go up to a sunny 40, then get cloudy, windy and down to 15, all in the same hour... yikes! A lightweight, great-fitting running backpack can be our thermostat, taking stuff off, stashing it, and pulling it back out when needed. Having extra warm clothes in winter can give us a sense of security, especially if something happens and we have to stop or walk. Pack like a Boy Scout; include your phone, T.P., GU or sport bars, water, cash, snow traction devices and whatever else will give you the confidence to head out the door! You are a self-sufficient athlete off on an adventure, dig it! Randy Step, an admitted obsessed runner who likes to be prepared. Happy New Year! P.S. : Time to sit down with the 2019 RF Events calendar and plan your year! We've got distances from 1 Mile to 100 miles and there are so many amazing venues and trails to be visited! Check it out HERE, start making your list... and checking it twice! The more you run, the more you'll earn! Our Run More, Earn More program gives you back $20 for every $150 you spend on race entries... just sayin'! P.S. : Shake up your winter fitness with a Northern Michigan adventure! Join us on January 26 for a romp through the woods at Bigfoot Showshoe Race 5K & 10K in Traverse City. Beginners and serious 'shoers welcome! The deadline to add lightweight hoodie and/or cozy beanie during registration is January 7! 2018-2-05 - I will run outside! 2018-10-17 - You are an athlete!